The numbers in the table do not add up as you might expect. This is because they include points for wins against the absent MCark, and for byes while it was included in the tournament. Near the end of round 1, MCark stopped moving in its game with Zen9, and lost on time. Throughout rounds 2, 3, and 4, MCark was not connected to the server. In round 3, oakfoam, as black, achieved a jigo against MyGoFriend. In round 4, after MCark has lost its fourth game on time, I gave up hoping that its operator would reconnect it, and removed it from the tournament, leaving an even number of players. In round 8, pachi2 was two minutes late for its game with oakfoam. It still won. In round 10, oakfoam, as black, achieved another jigo against MyGoFriend. In round 11, oakfoam, as black, achieved a jigo against ManyFaces1. But in fact it may not have missed the snapbacks; rather, its move 47 is irrelevant as its position was already hopeless. If instead it had blocked at c6, White would still play at 48, capturing and winning; while if it had connected at e5, White would push through at c6, securing more than half the board. In round 13, Zen9 (as Black) and then oakfoam passed in the position shown to the left. Zen has won: the 14-stone white group in the bottom left is dead (Black can play at a2 and then b1, almost filling White's eyespace with a bulky-five shape). However they disagreed about the status of the 14-stone group, and the game entered the clean-up phase. Oakfoam again passed, and the game was immediately declared over, with all the stones on the board counted as alive. The game was therefore counted as a win for oakfoam. It seems to me that Black was never given a chance to show that it could capture the dead group. I shall check, and if my understanding is correct, I shall report this to KGS programmer 'wms' as a defect in the clean-up mechanism. The round 20 game between stv and MyGoFriend was also mis-scored. Two dead white stones were accepted by both players as alive. This increased stv's margin of victory, but did not affect the result. In round 21, oakfoam, as black, achieved a third jigo against MyGoFriend. 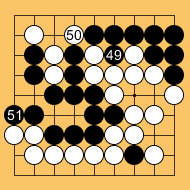 I suspect that MyGoFriend was trying to win by half a point, not understanding that the komi was on 7, not 7½. 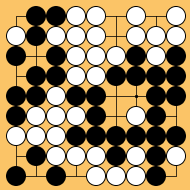 In round 24, the last three significant moves are as shown to the right. My understanding of them is as follows. Move 49: Zen9 as Black had no way to avoid losing, so this move was as good as any. Move 50: This move is worthless. But MyGoFriend thinks the komi is 7½, and therefore believes it has won whatever it does. 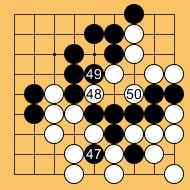 Move 51: This secures a jigo for Zen9. If you believe, as most MC-based programs do, that a win by half a point is as good as a win by thirty points, then it is advisable to understand what the komi is.